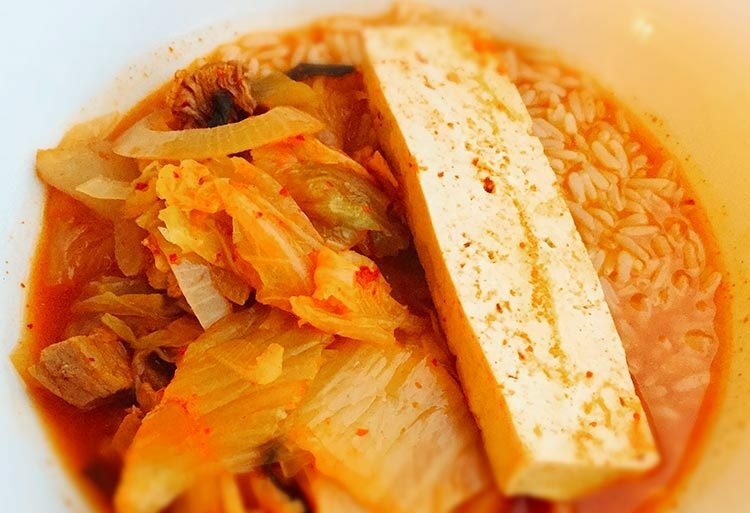 Let me begin by saying if I could eat one thing, and one thing only for the rest of my life, I wouldn’t hesitate for an instant before picking Kimchi Jiggae. Let’s start with Kimchi- it’s cabbage mixed with some other fruits and vegetables (spring onion, pear) that is then fermented with lots of spicy goodness. It is without a doubt one of the healthiest foods you can consume (I dare you to find something it DOESN’T remedy here). This is the case for many fermented foods. If you feel like reading up, I highly recommend the book Wild Fermentation. 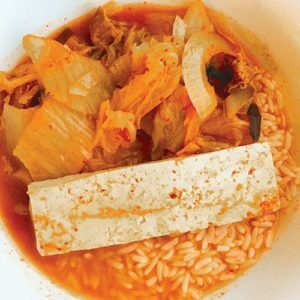 Next over to the ‘Jiggae’: Kimchi Jiggae is essentially a spicy soup made from Kimchi, pork, spring onions, and tofu. There is no limit to the amount I can consume. Lately I’ve discovered Maangchi, a charming Korean blogger and chef who the New York Times refers to as ‘the Korean cousin of Julia Child’. It ain’t for nothing. She is fantastic. If you’ve got some time, watch her videos. Combine the kimchi and brine, the pork, onion, the spring onion in a shallow pot. Cover and cook for 10 minutes over medium high heat. Open and stir, and lay the tofu in slices over the top. Cover and cook another 10 to 15 minutes over medium heat. Chop 1 green onion and put it on the top of the stew as a garnish. Remove from the heat and serve right away with rice.